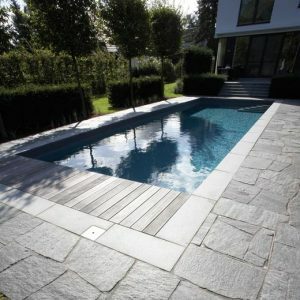 Should I seal concrete and stone pavings? With the cost of materials and home repairs up, it only makes sense to maintain what you own. Even though concrete and stone perform well without being sealed, the benefits of applying a high-quality sealer are worth the extra dollars spent. Some of the main reasons why it should be sealed is to extend the longevity of the concrete or stone structure, reduces cracking and increases curb appeal (which will keep the value of the house up). Furthermore all exterior concrete slabs or stone pavings exposed to freeze-thaw or extreme weather conditions should be treated with a sealer, as the sealer helps protect the surface from moisture absorption, exposure to chemicals and grease and oil stains. What sealer do I need? Generally, there are two types of sealers for exterior concrete or stone pavings: penetrating and film-forming sealers. Penetrating sealers (as the name says) penetrate into the substrate, which turn the concrete and stone water repellent. Generally penetrating sealers tend to offer the best protection from moisture absorption. Film forming sealers leave a coating behind, which can be worn down, where as a penetrating sealer will soak into the concrete stone substrate and cannot be rubbed off or blister. Pretty much all sealers are water repellent, though some are better than others. Some penetrating sealers have the added benefit of also being oil/stain repellent, to mostly to a little bit a higher cost. Many natural staining components are water-borne and can be eliminated with a water repellent sealer. If a surface has a high chance of getting in contact with oils (drive ways with motor oils or cooking areas) it is highly recommended to choose a water and oil repellent sealer instead. Good companies will offer you a free sample to see if the sealer is what you are looking for. The 2 questions to ask yourself is, “Do I want a glossy or a natural finish” and “ Do I prefer the colour of the concrete or stone as it is, or do I want to enhance the colour?”. Firstly, if you wish to have a glossy finish your only option is to go for a film forming sealer. There are some great gloss finishes out there, though keep in mind that any film forming sealer can blister, wear down over time and peel off. As it is a cover over the paving directly, any colour can be added to the sealer (paint sealer). Though in any case, the texture of the surface will change, and there will always be a change in appearance. If you enjoy a natural finish, it is recommended to go for a penetrating sealer instead. Penetrating sealers will leave the texture of the concrete or stone the same as it would be naturally, but will soak deep into the substrate and make it water/stain resistant. Nowadays penetrating sealers come in an absolutely natural finish or in a colour enhancing version, which will make the stone/concrete pavers look deeper and richer in colour. In the end, it comes down to your taste which option you wish to have. Sealers come in tow kind of variation – water based and solvent based. The general rule used to be, for more permeable surfaces a water based sealer is more suited, whereas for denser substrates a solvent based sealer is what you would want to go for. That said, technology caught up a lot, and nowadays the water based sealers work just as well on both kind of surfaces. Normally water based are not only the environmentally friendlier option, but can often save you a couple of dollars in your pocket too. How to apply the sealer? Applying a sealer is an easy and low cost process which can easily be done by a handy DIY person. Normally sealers are rolled on (with a painting roller kit) or sprayed on (with a weed killer sprayer). If you do not feel up for the task, you can hire a qualified installer to do the work for you. Tech-Dry is a 100% Australian owned sealer and admixture manufacturer focusing in silicone building protection products with over 30 years of experience. Since 1982 we are research, create and produce all our products locally. If you are still looking for a sealer, need personal assistance or have further questions, please contact us, we are happy to help!